Are you craving comfort food but don’t want to give in? 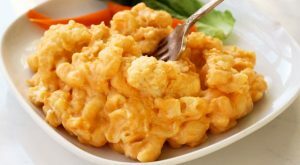 Try our Paleo + Gluten Free + Dairy Free Mac & Cheese! 1. Cut the stalks and leaves off of the cauliflower and break it into small pieces. 2. Add the cauliflower to a large sauté pan as well as the 2 tbsp. butter, ½ tsp. salt, and water. Place on medium/high heat and cover with a lid. Let the cauliflower stead inside the pan for about 5 minutes, until mostly tender. (Make sure to check the water levels every few minutes to make sure that it doesn’t all evaporate). 3. When almost tender, remove the lid and let the cauliflower sauté for a minute or two. Turn heat off, cover, and keep warm until ready to toss in the cheese sauce. 1. Heat the 2 tbsp. butter in a saucepan over medium/high heat. Add the squash, carrot, onion, garlic powder, mustard, and salt to the melted butter. 2. Sauté for 5 minutes, or until onion is translucent. Add the can of coconut milk to the saucepan and simmer for about 10 minutes, or until the vegetables are tender and the coconut milk has reduced by 2/3 and is thick. 3. Pour the vegetables and coconut milk into a blender and puree until very smooth. Immediately add an egg yolk to the puree and blend well. (The hot puree will cook the egg which will thicken the sauce and give it a rich texture). 4. Pour over the hot cauliflower and toss to cover.